Twitchy is a more conservative website that is not afraid of being snarky. 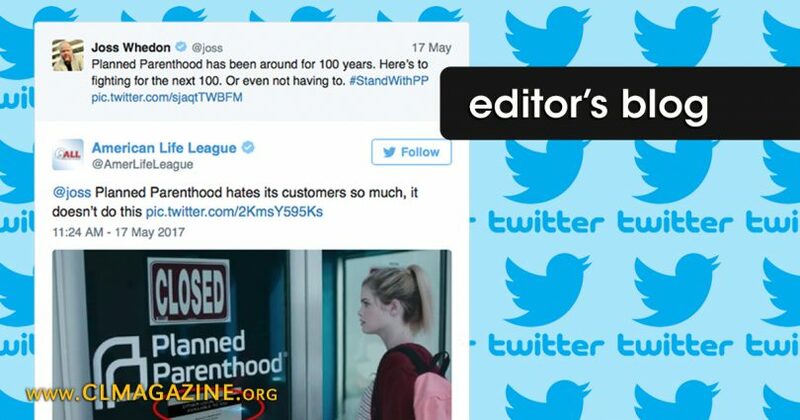 This week, the website covered Joss Whedon’s new spot for Planned Parenthood. Joss Whedon is a man of uniquely despicable taste and a serious lack of respect for others. He once demeaned teenage cancer survivors to take a cheap shot at Republicans (see here), for example. He is hardly somebody you want on your side, unless you are PP, of course. Whedon’s spot for PP depicts dramatized deaths from cancer based on what would happen—or what deranged individuals who support PP pretend would happen—if the government shut down PP. American Life League was honored to see quite a few of our pertinent tweets used in this Twitchy piece, which is well worth a read. So, without further ado, I invite you to click here to have a look.